I had the pleasure of working on this biannual insert soon after joining the Special Projects team and it's been so much fun (and yes, so much work). 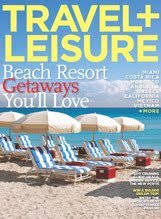 I've had to: ask hotel PR reps for amazing hotel deals and family travel packages, call in cool new carry-ons that cater to different members in the fam, research and pull in cute clothes and accessories for a fashion page and interview a teen about his favorite places around his hometown. Not all appear in the print edition of the magazine sent to target subscribers (the roundup of roll-aboard luggage and travel deals do), but if you get the T+L Family iPad app, which rolls out in a couple weeks, you'll get to read all of the above and then some. What a fun thing to work on and get paid for! Your job sounds so much more exciting than mine. Trust me it's not all fun and games guys. I just haven't mentioned any of the "Argh! I can't think of the right sentence for this intro!" moments that I've had in the last couple weeks. But it's worth it for the good bits and the pride that comes once it's finished.